Last week's launch of Transform's new book 'After the War on Drugs; Blueprint for Regulation' has received a large volume of high quality media coverage in the UK (see here) and Internationally (a full round up will be posted tomorrow along with detail of the US, Australia and Mexico launch events). This week Steve Rolles was invited onto CNN international show Connect the world , to discuss the new book in the 'connector of the day' slot (it is broadcast to 200 million households although what that means in terms of actual viewers isn't clear, although going by the spike in web hits presumably lots). The clip below unfortunately does not include the 90 second trailer film that outlined the arguments in the book and introduced Transform and the author. The Connect the day blog post for the slot also attracted, at time of writing, 210 posts, overwhelmingly supportive of the Transform position, and gratifyingly more than the levels of interest that the blog normally pulls in for the more usual showbiz guests . Transform Drug Policy Foundation today launched the internationally groundbreaking new book 'After the War on Drugs: Blueprint for Regulation', at 11.15am GMT, 12th November 2009, in the Grand Committee Room, House of Commons. It will also be launched in the US (see below for details), mainland Europe, Central and South Americas, Australasia and Asia. 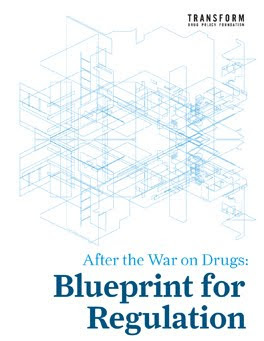 For the first time anywhere, ‘Blueprint’ provides a detailed roadmap showing how to legally regulate all currently prohibited drugs by proposing specific models of regulation for each type, coupled with the principles and rationale for doing so. These include doctors’ prescriptions, pharmacy sales, licensed premises and off-license sales. Speakers at the House of Commons include: Ms. Robin Gorna, (Executive Director, International AIDS Society), Professor Rod Morgan (former Chair, Youth Justice Board) and Dr Ben Goldacre (Guardian ‘Bad Science’ Columnist). There is growing recognition globally that the prohibition of drugs is a counterproductive failure. However, a major barrier to drug law reform has been fear of the unknown – what could a post-prohibition regime look like? In answering that question, Blueprint demonstrates that legally regulating drugs is not a step into the unknown, but a tried and tested approach to control drug production, supply and use. “It doesn’t take a rocket scientist to show that criminalising drugs has led to a dramatic increase in drug-related harms, and that controlling and regulating their production and distribution would go a long way towards reducing those harms. A range of Latin American governments have already moved, or are moving, towards decriminalisation of drug possession and are shifting to a public health model to prevent and treat misuse of drugs. They are no longer able to tolerate the damage done to their societies by the War on Drugs. "Much of what we call the drug problem is caused by the fact that prohibition gifts the market to criminals. Government regulation and control would help stabilise transit and producer countries, significantly reduce property crime and the prison population, improve the wellbeing of drug users and their families, protect young people and vulnerable communities and save billions of pounds that could be spent on dealing with the root causes of problematic drug use." 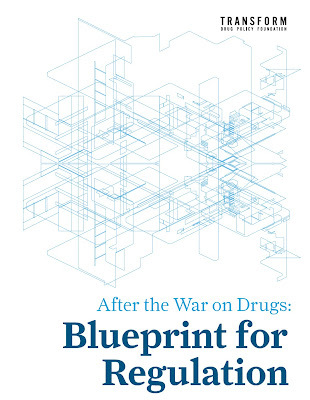 Transform is pleased to announce that our latest publication, 'After the War on Drugs: Blueprint for Regulation' will be launched at an event in the House of Commons on November the 12th, with simultaneous launches taking place in the US (at the Drug Policy Alliance conference in Albuquerque), Australia and Mexico. December will see further launch events in Brazil and the EU parliament. We demonstrate that moving to the legal regulation of drugs is not an unthinkable, politically impossible step in the dark, but a sensible, pragmatic approach to control drug production, supply and use. Hardback copies are also available. Exec summaries are available in print and pdf format in English, Portuguese and Spanish. MPs from the Cross-Party Group on Drugs and Alcohol Treatment and Harm Reduction (DATHR) have today tabled an Early Day Motion (EDM) calling on the Government to base its drugs and alcohol policy on scientific evidence. The call comes in the wake of the forced resignation of Professor David Nutt as Chair of the Advisory Council on the Misuse of Drugs (ACMD). "Following the debacle over Professor Nutt, there is a widespread concern now that the Government is moving away from an evidence-based drugs and alcohol policy. An open debate about the dangers of legal and illegal drugs should be welcomed by the Government." "Ignoring scientific advice and evidence about the harms and effects of a drug classification has serious consequences for public health and for the over-criminalisation of young people. The key priority in these areas must be what is effective not political or populist posturing"
The cross-party group on Drugs & Alcohol Treatment and Harm Reduction was established in October 2008 and brings together MPs and peers from all political parties and none with practitioner organisations delivering services to drug and alcohol users. The Advisory Council on the Misuse of Drugs (ACMD) was set up under the Misuse of Drugs Act (MDA) in 1971 on a premise that was thought radical at the time - an independent panel of heavy-weight experts from a range of fields would offer policy advice on drugs not just as a criminal justice issue, but as a social phenomenon too. Sadly, for most of its existence the ACMD has been used by the government, as one member Dr Les King put it: ‘...as a rubber stamp, a poodle'. That changed with the appointment of Professor David Nutt. He is outspoken, principled, and not easily cowed by authority figures, as well as being a leading specialist with impeccable scientific credentials. That combination proved too much for the home secretary, Alan Johnson, who sacked him for telling an inconvenient truth - government policy is not evidence based. In fact it is an evidence-free zone. Both internationally and domestically, we see drug supply and availability increasing; use of drugs that cause the most harm increasing; health harms increasing; and massive levels of crime leading to a crisis in our criminal justice systems. Illicit drug profits are enriching criminals, fuelling conflict and undermining security and development in producer and transit countries from Mexico and Guinea Bissau, to Afghanistan and Colombia, with the gravest impacts falling upon the poor and marginalised. Yet particularly at a time of economic stricture, it is crucial that drugs expenditure is cost-effective and humane, which it often manifestly is not. That is why we have been urging the ACMD to call for a comprehensive review of policy, in the form of an independent and comprehensive impact assessment of the Misuse of Drugs Act. 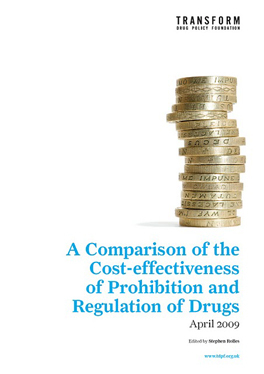 An impact assessment comparing the costs and benefits of current policy with all the alternatives, from stepping up prohibition, through Portuguese-style decriminalisation, to legal regulation would be a process behind which all stakeholders genuinely interested in evidence-based policy could unite, helping break the emotive, polarised deadlock in the debate around drug policy reform. In the longer term, it would ensure greater transparency and trust in the decision-making process, and most importantly help to determine which mix of policies is most likely to deliver the best outcomes. In the UK, it is now a requirement for all new legislation to have an impact assessment done before it comes before parliament, but this was not the case in 1971 when the MDA was enacted. As we stated during a recent meeting with the prime minister, we believe it is time to correct that anomaly. The UN should also carry out a similar exercise at international level to incorporate impacts on producer and transit countries. Accepting the evidence will demand a much more fundamental reform of how drugs policy is handled by the government than tweaking the MDA. Just as with terrorism where security concerns are paramount and there is huge resistance to considering the root causes of radicalisation, the Home Office perceives everything in a criminal justice light. In American psychologist Abraham Maslow's analogy, when the only tool it has is a hammer, it sees all challenges as nails. Ultimately, we need to de-securitise drugs policy, get the lead on it out of the Home Office, and into the normal kind of cross-departmental framework within which other elements of government social policy operate. This article originally appeared on the Progress website here. Double Standards from the Evening Standard on cannabis classification? The row over the firing of drug expert David Nutt was almost inevitable. Professor Nutt, chairman of the Advisory Council on the Misuse of Drugs, was dismissed at the weekend; Home Secretary Alan Johnson accuses him of running a campaign against official policy. But Professor Nutt made his comments about the Government's policy on cannabis under extreme provocation. The ACMD was set up in 1971 as an integral part of the Misuse of Drugs Act year: its purpose is to advise ministers on the latest scientific thinking on drugs, and the intention of the Act was for that advice to inform policy. So it was that cannabis was downgraded from a class B to a less dangerous class C drug in 2004, on the ACMD's advice. In 2008, however, the Government reclassified cannabis as class B, despite the ACMD's objections - not because of the science but largely thanks to a media hue and cry over the alleged dangers posed by strong "skunk" cannabis. If that is to be the basis of policy, it is hard to see what the point of the ACMD is any more. The bigger worry is what this suggests about ministers' attitudes to science and to spin. Gordon Brown likes to portray himself as less obsessed with spin and headlines than his predecessor. That was always implausible but when such cynical objectives override science, and a policy that affects many people's lives, that is truly depressing. There's a lot of important issues raised by the ACMD chair's sacking, and the subsequent reaction. 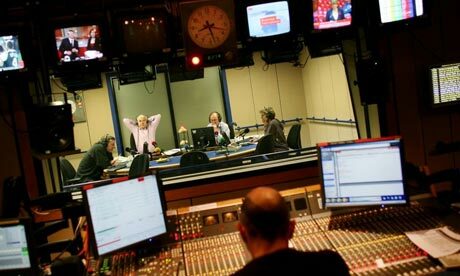 Transform have been actively engaging in the debate in a range of broadcast media, including 5 live radio, and BBC and Channel 4 news. We will have more to say on all this as the story develops over the next few days but in the mean time follow the media coverage in the Miniblog (on the right) or on Twitter.